Todd Rinaldi, a Fish and Game research biologist who specializes in wolves and their movements, and a tranquilized wolf. Questions are from children who attended a wolf program this winter at the Eagle River Nature Center. Q: How many wolf pups are born in an average wolf litter? A: In Alaska, litter size averages 5-7 pups. In the high Arctic, fewer pups are born as a result of the more scare food sources. Q: Do wolves ever eat garbage or scavenge like bears? A: Wolves are opportunistic in the respect that they seek out easy meals. Although wolves hunt moose, caribou and other mammals, hunting forays are not always successful and wolves will scavenge old carcasses, and pursue garbage if they live in areas where humans and wolves overlap. This is particularly true in places like Poland and Italy. As we saw earlier this year in Anchorage and Fairbanks, when snow is low and moose are hard to catch, wolves may try to get animals like dogs and chickens to survive. Q: How fast do wolves run on average? A: Wolves can effortlessly move at 6 miles per hour for many miles per day (adult humans walk at about 3-4 mph). Their top speed is somewhere around 15 to 20 mph. Q: What is the estimated population of gray wolves in the Southcentral region? A: We do not know for certain but the statewide estimate is 7,000 to 11,000 wolves. Based on that, a reasonable guess for Southcentral might be somewhere around 2,000 to 3,500 wolves. Q: Why don't wolves live very long? A: The environment wolves live in is harsh. Wolves live 4 to 6 years on average. Food is hard to acquire and wolves are subject to getting kicked by moose, attacked by bears and other wolves, and have to tolerate difficult weather. Wolves that live in areas where there is little or no hunting or trapping can live longer, roughly 6 to 8 years on average. 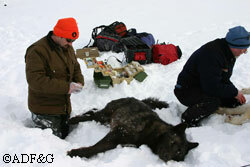 During my research, I have captured a wolf at the Nelchina Glacier that was 13 years old, which is very old for a wolf!